Well, somehow we’ve become soccer parents. We’ve done the school soccer thing for a few years now. Heck, we’ve even coached a soccer team… but coaching first grade soccer is mostly about getting everybody showing up at the right field at the right time with their shoes tied. And when the kids play on the school team, it just feels like an extension of gym class. It’s just one of those things you do as part of a well-rounded education. But now both kids are playing with their classmates in a recreational indoor soccer league. That word “recreational” means we can’t easily pretend this is something we’re doing for the kids’ education. Supposedly, we’re doing this for fun. Of all of us, Alex is the only one who’s clearly having a good time. The kids rotate positions in this league, and Alex’s favorite is goalie. (I suspect that’s because it involves the least running and the least footwork.) While he doesn’t show any natural physical talent for the position, he’s got one huge mental advantage: It doesn’t bother him at all when the other team scores on him. He cheerfully keeps playing, cheering for his teammates, and enjoying his special Sunday time with his friends. 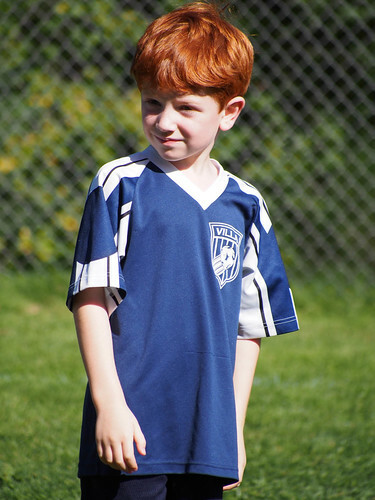 While first-grade Patrick is a better soccer player than first-grade Alex was, the jury’s out about whether he’s doing recreational soccer because he’s having fun or because his big brother is doing it. Time will tell. And for us, the parents? Well, at least indoor soccer is warm and dry. I don’t have any indoor soccer pictures, so this will have to do.